The municipality of Itamos (according to the Kallikrates plan 2011, belongs to Karditsa municipality) covers the south part of the prefecture of Karditsa. 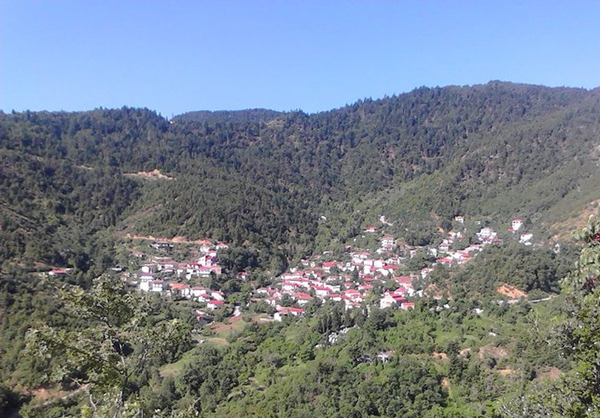 It is a mountainous / semi-mountainous municipality created from the union of the following eight communities and settlements: Amarantos (also Koutsouro settlement), Ampeliko, Kallithero, Karoplesi, (Agia Agathi, Anthero, Giannouseika settlements), Katafygi, Neraida (Mega Lakos, Sarantaporos settlements), Rahoula (Paleozoglopi, Itamos, Zogri settlements). According to the 2001 census, the total population comes up to 4.726 people. It is the municipality with the biggest forest area in the prefecture. It has the privilege of being near the Plastiras Lake. The natural environment is beautiful and virgin, crossed by the Tavropos tributaries, adorned by beautiful gorges and high mountain tops. The innumerous streams and valleys near the rivers contribute to the development of rich flora and the creation of a big variety of ecosystems. Hundreds of plant and animal species find shelter in the quiet "nest" of this Agrafiote corner. The road connections of the municipality with regions of the prefecture of Evritania (Agrafa, Kleisto, Mavromata), with the exquisitely beautiful routes, the extensive forest and prefectural road network crossing the municipality and connecting the boroughs and the tourist attractions are additional benefits. Nature lovers can enjoy the majestic Agrafa landscape and visit Plastiras Lake; they can enjoy the beauty of the natural ecological park with the abundance of water in the rivers and the gorges in the south part of the municipality and head for Karpenisi and Agrinio. Moreover, the municipality of Itamos has the privilege of being "hosted" in an area with an age-long history and be proud of the rich archaeological findings in the lowland districts and the important religious and cultural monuments dispersed everywhere within its borders. Starting from Karditsa, at a distance smaller than 10 km we come upon kallithero, the seat of the municipality of Itamos, built on the ruins of the ancient city of Kallithira (4th century BC). Excavations in the area have brought to light important archaelogical findings. At the top of the hill of Aghios Athanasios, at Kallithero, a square castle dating back to the 6th century BC has been revealed. Three more archaeological sites are open to visitors. At a very small distance from Kallithero, we come upon Ampeliko where grave goods from ancient tombs were found at the ruins of the ancient castle. The central point of our getting to know the villages of the municipality is the Rahoula - Kastania - Katafygi junction, approximately 2 km after Kallithero. Driving from this junction along the ravine green with planes, next to sheep pens and multicolored wild flowers in the spring, after going uphill for 6 km, we reach Katafygi. In the village, there is a guest house, taverns and traditional cafes. The people of the village feel quite close to the Holy Monastery of Petra which is located 4 km NW. It is dedicated to the Dormition of the Theotokos and celebrates on the 15th of August with many religious festivities. It is named after the rock on the NE part, where according to the tradition, some shepherds saw the icon of Panaghia the Hodegetria, a work of Luke the evangelist. It is one of the most elegant and important monuments of the region, probably built in 1550. According to the inscription on the lintel of the entrance, the wall paintings date from the year ΖΡΛΓ (1625). 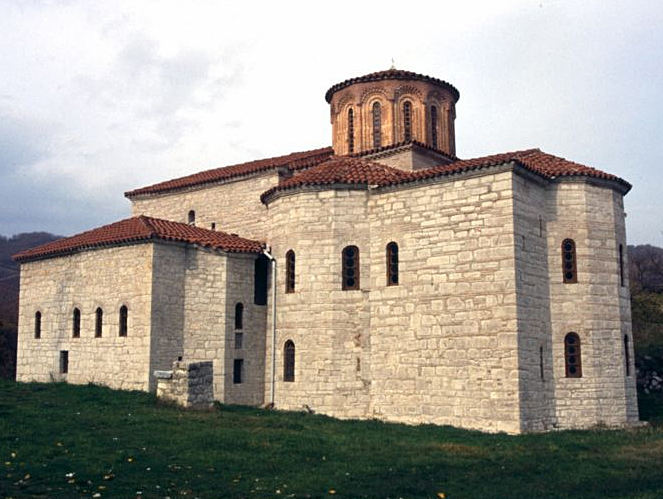 The monastery today accommodates a monk fraternity and is open to visitors all year round. Starting from the monastery of Petra, we can head for Aghios Athanasios, a settlement of Lambero village, and Plastiras Lake. The route is approximately 5 km and the road is asphalted at least half of the way. If, upon reaching Rahoula junction, we choose to continue uphill on the wide road, we come upon Kastania in approximately 15 minutes. The village has a long tourist tradition and provides modern facilities, traditional taverns, a municipal guest house and rooms to let. 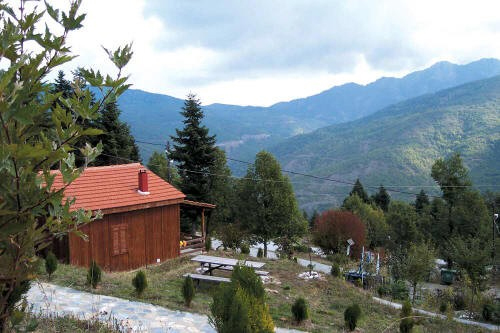 The village is built at an altitude of 800 m, within a fir and walnut forest, on the north slope of the "Tsouka" top, mountain Itamos, 23 km from Karditsa and very near to Plastiras Lake, it is the ideal place for summer and winter tourism. It has dry, healthy climate and easy access and it is near all the sights and accessible areas of the wider region of Plastiras Lake. The holy skull of Saint Tryfonas, patron of the vine, is kept at the village church which is adorned with an elaborate wood carved altar screen made of walnut, a work of the 16th century. The renovated village school hosts the Natural History Museum which aims st exhibiting samples of the region's flora and fauna, a project in the implementation phase. In Kastania, there is also Elias Koyias' craft industry which makes the traditional tsarouhia (traditional Greek shoes) and supplies many dance groups in greece and abroad with them. 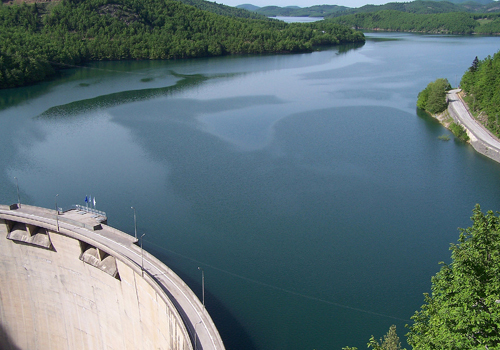 From Kastania, our route takes us around Plastiras Lake towards Mouha and the Tavropos Dam. 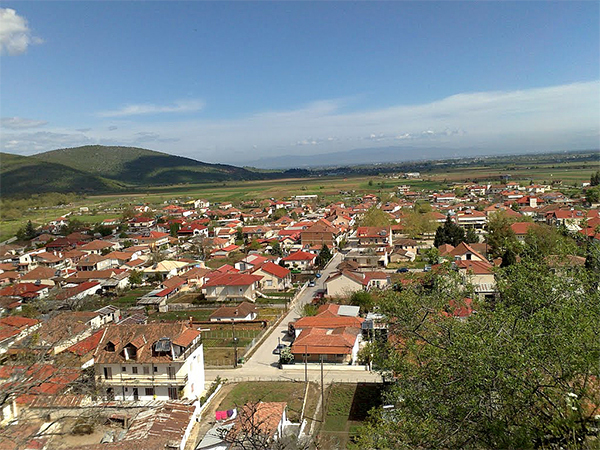 Mouha is built at an altitude of approximately 850 m, 4 km from Kastania. Visitors will enjoy local food, kokoretsi, fresh trout, local wine and tsipouro etc in the taverns and and the refreshment bar operating all year round. On the full-of-firs slopes of Pyrgouli, at an altitude of 1.000 m, there is a small church in the position of the old monastery of St Tryfonas. The location is extremely beautiful, the road quite good and the distance from Mouha less than 3 km. Our route then to the Tavropos Dam (picture above) at Kakavakia is short and pleasant. At a small distance from the Dam, there is the Information Center of the municipality of Itamos and a place where street vendors sell their products. Visitors can buy local products, frumenty, Greek Noodles, honey, aromatic plants of the Women's Union of the Municipality of Itamos, wine and tsipouro from local producers etc. It is an ideal area for information, recreation, pleasure and purchase of local and other products. The Tavropos or Megdovas Dam is 83 m high and 200 m long and its construction was concluded at the end of the 50's. The creation of the Tavropos Dam stopped the flow of the river and transformed the Nevropolis plateau into a lake. According to mythology, Tavropos was a god. He is depicted on an ancient vessel having a human body and a bull's head with horns. He fought with Hercules for the heart of beautiful Deianeira but he lost when Hercules broke one of his horns. Prior to the creation of Plastiras Lake, the Tavropos or Megdovas River, with its sources at Voutsikaki, crossed the Nevropolis plateau. Enriched with the waters of the tributaries of the southeast part of the municipality of Itamos, it ended in the Acheloos River and then the Ionian Sea. Its waters, today, not as much as in the past, end up in Kremastos Lake in Evritania. If you decide to cross the Dam, you will find it a unique experience. The feelings created are many and change quickly: fear, joy, awe, ecstasy, all together. Looking on the right we see with awe the depth of the waters, on our left, the same feeling from the bottom of the gorge of the once violent Megdovas River. Going past the Dam, we head towards the west side of Plastiras Lake. It is a very beautiful area very near Plastiras Lake, south of Kastania. The green Itamos, the mountaintops og "Koimomeni" (sleeping lady) and the formations of the rivers crossing the area create an extremely beautiful landscape, a huge ecological park with many changes, abundance of vegetation and rich flora. About 10 km south of Kastania, near Karoplesi village and Anthiro settlement, we come upon the forest village "Dryades", at an altitude of 950 m. "Dryades" consists of 20 wooden two-area houses spread on an area of 25 acres full of firs and oaks, with a capacity of 80 beds. The housesare simply constructed but comfortable and economical and have stone traditional fireplaces, showers and water heaters. The restaurant of the "village" operates all year round and is the meeting and recreational place of all visitors. There are sports facilities and plenty of parking spaces in the surrounding area. Leaving the Forest Village we can visit the Holy Monastery of Saikas, 4 km of a panoramic route along the Aspros River and from there continue for the Evritania Agrafa and Karpenisi. We can also visit Karoplesi with the traditional cafe-taverns, only 6 km away of the fish farm at Mantania, a few meters from the Aspros Bridge, to enjoy the tasty trout, to get to know the way the "nerotrivi" and the traditional water mill operate etc. 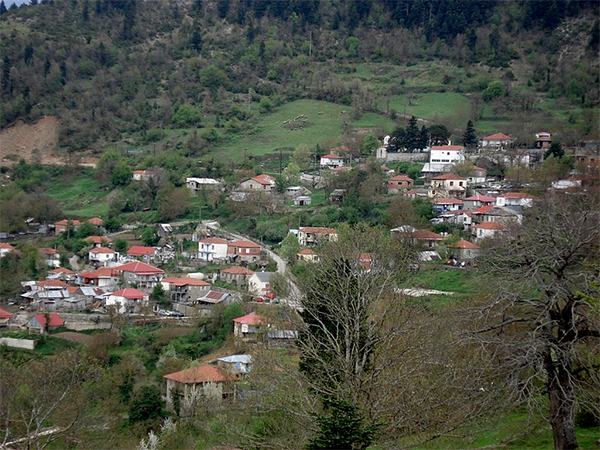 The biggest housing settlement of Karoplesi is Giannouseika, on the slope of mountain Itamos. Access to the settlement is easy from the junction, on the way to the Itamos fountain, approximately 1 km from the central road axis. Every year, on the day of St. Panteleimon (July 27) a big fete, an event with traditional music and lambs on the split, is held outside the settlement. At a distance of 5 km from Giannouseika, there is the Holy Monastery of Neraida (16th Century) with the well kept frescoes of Ioannis the Eftelis (the unworthy). The monastery is dedicated to the Birth of the Theotokos and celebrates on the 8th of September with paneryir religious celebrations. The road then takes us to the other villages of the municipality of Itamos, to Karditsa, Karpenisi (approximately 55 km) and Agrinio (130 km) through Mavromata. The road to Karpenisi and Agrinio in the prefecture of Karditsa is difficult if one doesn't have a suitable car. The third route to be followed in order to get to know the municipalityof Itamos also starts from the road junction below Rahoula. Taking this time, the left road axis of the triple junction, after three km we come upon Rahoula (Zoglopi) The village includes the following housing settlements: Paleozoglopi, Itamos and Zogri. The permanent inhabitants of the village are 300 and are mainly involved in farming, cattle raising and selling local products. The garden produce and any exploitable products of nature (figs, nuts, herbs, leaf mould etc) are sold by the industrious people of Rahoula in the Karditsa market place and elsewhere. During the summer, when the village and the settlements bustle with life, many fetes and festivals are held in Rahoula and its settlements. There are three small stone bridges near the village. The most important one is the single-arched bridge at Ktismata location on the old road from Rahoula to Paleozoglopi. It has been declared as a "new monument" with a resolution of the Ministry of Culture. Going past Rahoula, an asphalted road of approximately 7 km leads us to Paleozoglopi settlement. The Florakis museum which is in its last impementation stage, was founded in Paleozoglopi with the initiative of the municipality of Itamos. From Paleozoglopi, following a very beautiful route of 3 km passing under a great variety of trees and leafage, we come upon the Itamos fountain near Plastiras Lake. Over the fountain, in a majestic landscape covered by towering firs, a refreshment bar is open during summer months offering a rich variety of foods. Approximately 6 km after passing by Paleozoglopi and Itamos, we come upon Amarantos. 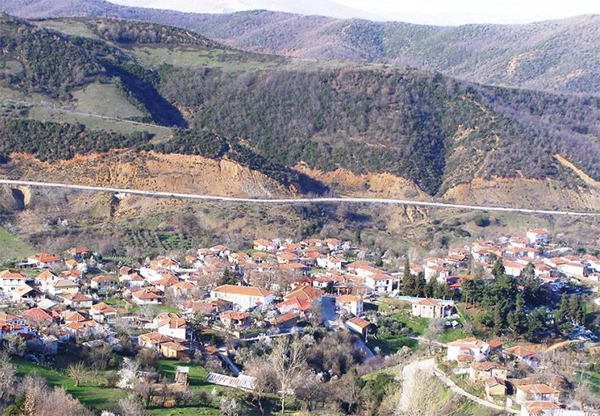 A village 24 km from karditsa, built at an altitude of 750 m with a wonderful climate. Apart from the traditional cafes, there is also a guest house in the village offering quality services. The visitors of the guest house can be guided in the area. They can enjoy the beautiful walk on the path, lasting about 4 hours, starting from the top of the village end ending at the top of mountain Itamos and leading from there to the fountain with the same name. The village church, the Dormition of the Theotokos, is adorned with an elaborate wood carved altar scrreen which, according to the tradition, was transported from Constantinople. At a distance of 2 km from the village, on the way to Sarantaporos and Neraida, under the huge planes, there is an organized recreational area with wooden benches as well as the Malagari fountain with its crystal clear water. The area is suitable for rest and recreation. About 10 km from Amarantos, there is Sarantaporo with its very few inhabitants. This village is an important point for our route. Depending on our strength experience, the time of the year and the equipment (suitable car etc) we have many options. We can head towards Neraida, Plastiras Lake (Holy Monastery of Neraida, Giannouseika), Moloha and from there to Karditsa (about 6 km of easy road), Karpenisi or Agrinio. Neraida of the Dolopes, which is the last village of our route, is 6 km from Sarantaporo, 41 km from karditsa and 60 km from Karpenisi. The road to the village is asphalted, while the rest of the road network of the area is not and is quite inaccessible in winter. The road up to Neraida until the borders of the prefecture of Evritania, has been integrated in the Pindos Programme and its asphalted will soon be completed. Tourist infrastructures are rudimentary, the nature exquisitely beautiful and virgin and the permanent inhabitants very few. There are cafes and cafe-markets in the village open all year round. They constitute a meeting and recreation point of the ew inhabitants and the passers-by. In summer, visitors can find tasty local appetizers (mezedes) enjoy the cool breeze and traditional hospitality. At a small distance from Neraida, along the banks of the Megdovas River, there are trout fish farms. The fans of tasty food and nature lovers will experience there moments of unique beauty and pleasure. 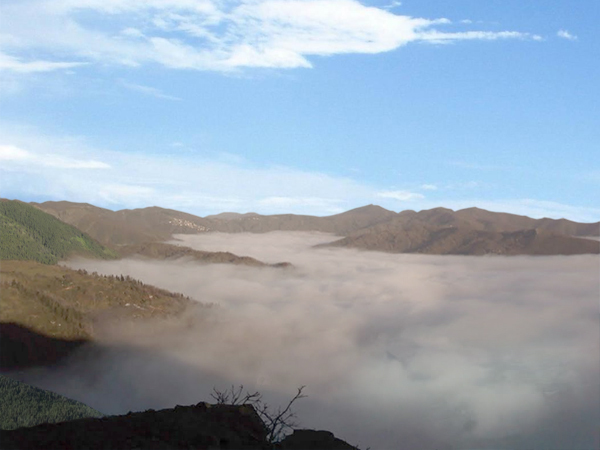 The region is suitable for the fans of adventure and natural lovers. The gorges, ravines, the rich fauna and the abundance of the riparian vegetation from the waters of the Sarantaporitis, Besiotis and Tavropos - Megdovas Rivers have been "created" for the local and "fastidious" nature lovers.